Of course you need the right kind of books in order to make the most of this special mommy-and-me time. A book that’s too long and wordy, or one with ho-hum pictures, is just not going to cut it. Which is why Mommy, Tell Me More—books 1 and 2—have become such popular books among so many mommies and children. 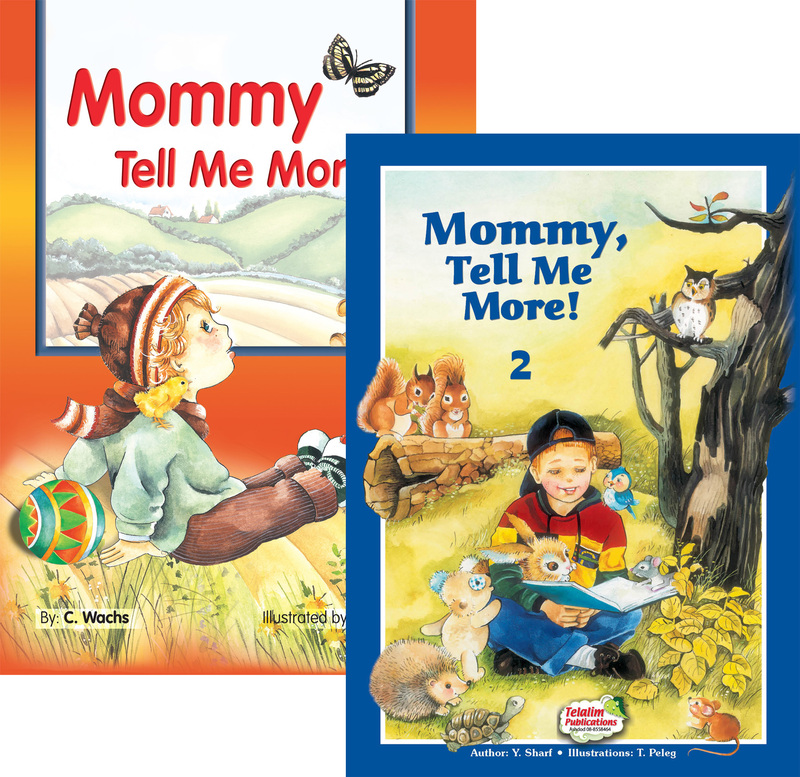 Each book contains text especially geared to a specific age; Mommy, Tell Me More volume 1 is directed to really young children (ages 1-2), while Mommy, Tell Me More volume 2 is for “older” children (2 and up). Everything about the books is both mommy- and kid-friendly: the educational text and stories, the enhanced language, the creative thinking the books engender, not to mention the stunning artwork by renowned illustrator Tirtza Peleg! You’re stuck in traffic late on Friday afternoon. The minutes are ticking by, and the pressure is mounting within you… Help! What should you do? You’ve been driving for hours down the 80, and you feel your eyelids start to droop. You need some heavy-duty caffeine, so you stop at a rest stop to buy some coffee…but there are no disposable cups there. Okaaaay, you tell yourself. Now what? You’re driving merrily down the street, singing along to your favorite CD, when…you see them: those dreaded flashing lights in your rearview mirror. Uh-oh, you think. What did I do this time? And, even more important, what do I do now? If you live in modern-day times and have a driver’s license, chances are that you are familiar with these types of “driving dilemmas.” And now, we are presenting you with a practical way to find solutions for all of these scenarios. Code for the Road, by noted author Rabbi Avrohom Bookman, is a handy and helpful manual that will provide you with the knowledge and know-how of halachically correct driving practice. Small enough to fit in your glove compartment yet comprehensive enough to include a whole lot of practical information, Code for the Road is an indispensable guide when it comes to the Torah’s perspective on basic driving and parking rules, the halachosof yichud in a car, brachos, and tefillas haderech, solutions to many driving dilemmas, and much more. So whether you’re en route on a quick drive to the grocery store, or a long road trip, be sure to pick up a copy of Code of the Road before starting out. And have a safe trip, too! She wants to help, she’s eager to please, she doesn’t mean to mess things up…she’s…Doda Golda! Whether it’s “turning over the kitchen” by flipping over each pot and pan, or “separating the eggs” by hiding them all in different places, Doda Golda sure knows how to spread laughter among her family…and among yours, as well! This is one book sure to bring out the let’s-get-to-work-and-help-out attitude in your children! If you’re trying to come up with an idea for an afikoman present that may simultaneously provide you with more eager helpers (or at the very least, some much-needed stress relief and laughter)—Doda Golda Comes for Pesach is the book you’ll want to get for your kids this Pesach! I know I quote many when I say that the world we are living in nowadays is not the same as it was years ago. Or, to put it simply, things aren’t how they used to be. How else can one describe the frightening trend of obsessions with various mediums, the substance abuse, the growing number of addicts within our own insular communities? It was to fight this development that Rabbi Dovid Goldwasser, world-renowned rav, speaker, and author, wrote The Addicted Soul. This book focuses on the common addictions of drinking, gambling, drugs, internet use, texting, shopping, and eating. In his clear, thought-out way, Rabbi Goldwasser first shows the destruction and harm of each addiction, and then presents methods for obtaining help and releasing oneself from addiction’s tight grip. This is a serious book as it is an important one. Addiction is not something to be taken lightly, as Rabbi Goldwasser explains in great depth. With The Addicted Soul, a person who finds himself hooked onto something in an unhealthy way has taken his first step to getting help…and gaining his freedom. NEW NOVEL – This is America! Growing up, life was about Chinese jump-rope, Bazooka gum…and When Zaidy was Young. As kids, we found nothing more captivating than listening to Heshy, Manny, Uncle Isadore, Mrs. Pitkin, and all the rest of Shmuel Kunda’s colorful cast of characters come to life on our family tape recorder (for the un-initiated, yes, we’re talking about the Pre-CD-Player Age). When I think about it now, though, I realize that as much as we loved the hilarity of those When Zaidy was Young tapes, a lot of their pull came from their endearing depictions of the Lower East Side of years ago. There was something so compelling, so…curious about the way life was back then, with haggling pushcart peddlers and crowded, dreary tenement buildings, in the city of New York that was so similar—yet so different—from what it is nowadays. This is America is not your typical book. It is a book that enlightens as it entertains; broadens your horizons as it provides enjoyment. Read it and see for yourself—you will not be disappointed!